Envirosafe Ireland offers the Ductaire fume cabinet, which provides full compliance with COSHH regulations and BS14175. 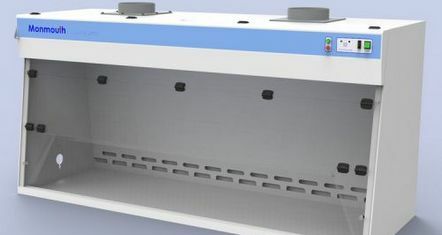 The ducted fume cabinets are supplied fully assembled, and are manufactured from welded Polypropylene which make them extremely resistant to most chemicals, offing an integral spillage containment area. The Ductaire offers excellent value for money and a variety of features to provide a fully functional ducted fume cabinet. Each unit is fully tested and certified and offers exceptional airflow characteristics and user safety. The front glazing folds up to allow full access to the working chamber and all electronics are fully isolated from this chamber. The Ductaire fume cabinet also features an integral cable access port to allow equipment to be easily installed. The airflow into the cabinet is constantly monitored and the user is alerted by audible and visual alarms should the airflow fall below optimum levels. Options available include, gas, water & drainage service, sinks or drip cups, base stands and under-storage cabinets.